There are few places left on earth that are as untouched and wild as the Australian outback, a landscape that has captivated imaginations and attracted thrill-seekers for millennia. It’s a part of the world that is at once unimaginably empty yet suffused with the dreams and histories of countless generations. Travelers, settlers, and indigenous peoples have managed to traverse the outback, but no one has been able to tame it. For these reasons, the Indian Pacific luxury sleeper train conjures up a sense of mystery, thrill, and old-world romance. Named after the two oceans it connects, the train makes two crossings each week, from Sydney to Perth and then back again. Each journey takes three nights and offers a slightly varied itinerary. Its management company, Great Southern Rail, also operates the Ghan, a north-south route between Adelaide and Darwin. My journey begins in Sydney after a couple days of sleeping off jet lag at the buzzy QT Sydney, a boutique design hotel located on Market Street downtown. The QT is Australia’s answer to Ace Hotels—lots of mid-century furniture, a barber shop, a mixology bar on the ground floor. For dinner, I meet an old friend at the bar at Bennelong located in the Sydney Opera House, where we spend the evening drinking too much wine and eating suckling pig sausage rolls. Many Indian Pacific guests will do a night or two like this in town before the journey, getting their last taste of Sydney’s posh amenities before heading west. Not that there is any shortage of amenities on the train—it provides everything you might need. When it comes time to board the Indian Pacific at Sydney’s Central Station, the scene is like something out of a Baz Luhrmann movie: The locomotive itself is gargantuan (some 30 cars long, stretching way out of sight), and a filigree of steam curves around the engine, which is emblazoned with a striking yellow and navy logo. Guests are quickly shown to their cabins, where a plate of local cheeses and a glass of Australian sparkling wine awaits. The rooms are comfortable, with pull-down beds that convert into overstuffed chairs by day. Each room has a built-in radio, and the channels range from the informative to the ironic—some play indigenous spoken-word stories and poems, others play jazz, still, others play ’80s power ballads. There’s something for everyone on this train. Best of all are the oversize windows, the better for taking in the epic landscape. The train pulls out of Sydney, then rolls up into the lush Blue Mountains, crosses them, then chugs along as the hills give way to rolling plains, and gray-green forest turns to reddish bush. You will never find it this easy to be so bewitched by a landscape. Not that you should spend too much time alone in your cabin. All the action occurs in the club car, where a bartender offers up fresh espresso, bar snacks, and a range of Australian wines and spirits, many of which aren’t available back home in the States. Dinnertime on board is a whole production as well. After exchanging how-do-you-dos and where-are-you-froms in the club car during happy hour, guests gingerly cross over to the dining car, drinks in hand, where a multicourse meal awaits. Food on board is a celebration of Australian cuisine, featuring favorites such as fresh barramundi filets, tender kangaroo, and locally raised lamb tagine. When dinner is finished and it comes time to stumble back to your room, you’ll find the beds turned down and a whiskey nightcap awaiting on your nightstand. Make sure to leave the window shades up before lying down—that way, you can doze off under a sky full of outback stars. Perhaps the most exciting aspect of the Indian Pacific is its itinerary of excursions and stops. For a trip that crosses the Nullarbor Plain—“Nullarbor,” from the Latin for “no trees,” is the world’s single largest exposure of arid, deserted limestone bedrock—there are surprisingly few periods when you’ll find yourself killing time on the train (even when it shoots across the longest stretch of straight rail track in the world, nearly 300 miles long). The stops are representative of the landscape the train traverses, and, frankly, are places that travelers might not be drawn to otherwise: There’s a morning visit to Broken Hill, an isolated mining community at the edge of New South Wales; an afternoon in South Australia’s exquisite Barossa Valley wine region, complete with tastings at the prestigious St. Hugo and Yalumba wineries; a quick stopover in the outback town of Cook, which has a population of four; and an evening in the abandoned desert station of Rawlinna, where the train pulls over to serve family-style barbecue under the stars. Between those excursions, guests take their time in the communal spaces where many will alternate playing cards and enjoying a glass of wine as the landscape unfolds. Keep your eyes focused out the windows at dusk especially—not just for some of the best sunsets you will ever see, but to spot some fauna as well. Every now and then a duo of feathery emus will scuttle away from the train tracks, or a kangaroo will bounce off into the twilight. Even when you traverse the outback by train, it’s hard to imagine just how vast it is, and even harder not to fall in love with its wild charms. When guests wake up on the fourth and final day, they’ll find they are no longer in the dusty expanse that makes up the center of the continent, but in the fertile Avon Valley, where wallabies poke their heads up from wildflower patches to watch the train chug along. 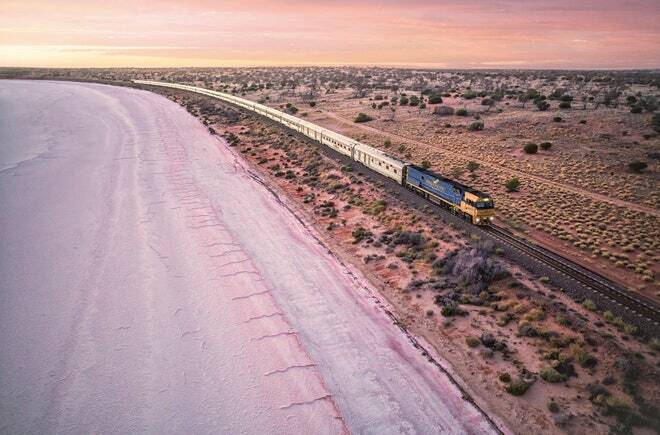 It’s a fitting finale to an epic transcontinental train journey, and by the time the Indian Pacific pulls into Perth that afternoon, the outback feels as fleeting as those wisps of smoke over the train’s engine—so extraordinary, you’ll wonder if it was all a dream.